Cobalt-based blue pigments (cobalt blue) have been used since ancient times for jewelry and paints, and to impart a distinctive blue tint to glass. The main source of the element is as a by-product of copper and nickel mining. The copper belt in the Democratic Republic of the Congo, Central African Republic and Zambia yields most of the cobalt mined worldwide. Cobalt is primarily used in the preparation of magnetic, wear-resistant and high-strength alloys. The compounds, cobalt silicate and cobalt(II) aluminate (CoAl2O4, cobalt blue) give a distinctive deep blue color to glass, ceramics, inks, paints and varnishes. Cobalt compounds have been used for centuries to impart a rich blue color to glass, glazes, and ceramics. Cobalt has been detected in Egyptian sculpture and Persian jewelry from the third millennium BC, in the ruins of Pompeii (destroyed in 79 AD), and in China dating from the Tang dynasty (618–907 AD) and the Ming dynasty (1368–1644 AD). Cobalt has been used to color glass since the Bronze Age. The excavation of the Uluburun shipwreck yielded an ingot of blue glass, cast during the 14th century BC. Blue glass items from Egypt are colored with copper, iron, or cobalt. The oldest cobalt-colored glass is from the Eighteenth dynasty in Egypt (1550–1292 BC). The word cobalt is derived from the German kobalt, from kobold meaning "goblin", a superstitious term used for the ore of cobalt by miners. The first attempts to smelt those ores for copper or nickel failed, yielding simply powder (cobalt(II) oxide) instead. Because the primary ores of cobalt always contain arsenic, smelting the ore oxidized the arsenic into the highly toxic and volatile arsenic oxide, adding to the notoriety of the ore.
Swedish chemist Georg Brandt (1694–1768) is credited with discovering cobalt circa 1735, showing it to be a previously unknown element, different from bismuth and other traditional metals. Cobalt became the first metal to be discovered since the pre-historical period, during which all the known metals (iron, copper, silver, gold, zinc, mercury, tin, lead and bismuth) had no recorded discoverers. Cobalt is too reactive to occur as a pure element in the earth. It is found in certain minerals. 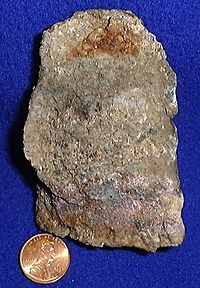 It is found with copper and nickel deposits. Normally the three metals are bonded to arsenic and sulfur. It is found as a byproduct (left over substance) when copper and nickel are produced. It is made by reaction with the sludge from copper and nickel processing. The main ores of cobalt are cobaltite, erythrite, glaucodot and skutterudite, but most cobalt is obtained by reducing the cobalt by-products of nickel and copper mining and smelting. 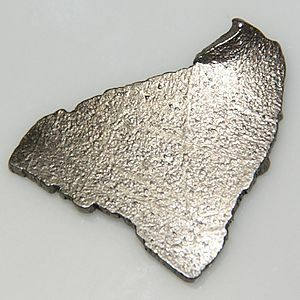 The main application of cobalt is the production of high performance alloys. 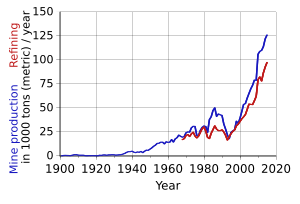 Cobalt-based superalloys consume most of the produced cobalt. The temperature stability of these alloys makes them suitable for turbine blades for gas turbines and jet aircraft engines. Cobalt-based alloys are also corrosion and wear-resistant, making them useful in medical orthopedic implants that do not wear down over time, special alloys are used for prosthetic parts (hip and knee replacements). Cobalt alloys are also used for dental prosthetic's. Lithium cobalt oxide (LiCoO2) is widely used in lithium ion battery cathodes. Typical catalysts are the cobalt carboxylates (known as cobalt soaps). They are also used in paints, varnishes, and inks as "drying agents". The same carboxylates are used to improve the adhesion between steel and rubber in steel-belted radial tires. Before the 19th century, cobalt was predominantly used as a pigment. 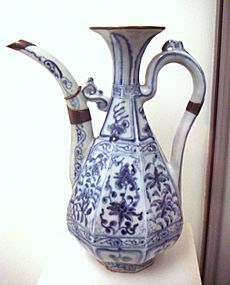 Since the Middle Ages, it has been used in the production of smalt, a blue colored glass. It is used in external beam radiotherapy, sterilization of medical supplies and medical waste, radiation treatment of foods for sterilization (cold pasteurization) and industrial radiography. The metal has the unfortunate property of producing a fine dust, causing problems with radiation protection. 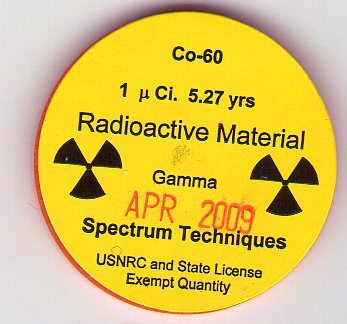 Cobalt from radiotherapy machines has been a serious hazard when not discarded properly. Cobalt is used in electroplating for its attractive appearance, hardness, resistance to oxidation; it is used as a base primer coat for porcelain enamels. Cobalt is essential to the metabolism of all animals. It is a key constituent of cobalamin, also known as vitamin BTemplate:Ssub. The minimum presence of cobalt in soils therefore markedly improves the health of grazing animals, and an uptake of 0.20 mg/kg a day is recommended because they have no other source of vitamin BTemplate:Ssub. The human body needs small amounts of cobalt for certain vitamins. Cobalt compounds are used to stop cyanide from poisoning the body., but cobalt is toxic in large quantities. Sometimes cobalt compounds were added to beer, and people that drank it were poisoned. It can cause skin irritation when touched. Cobalt is a transition metal. It is shiny and conducts electricity. It is magnetic. It is a hard metal. It is moderately reactive. It dissolves slowly in acids. Most soluble cobalt compounds are red. They can also be green, blue, brown, and black. Cobalt is a ferromagnetic, ductile metal, which is very similar to iron, but is much rarer than this. Cobalt Facts for Kids. Kiddle Encyclopedia.